lAkUnLeScReWs don gather from News making the rounds say Pastor William Kumuyi don offer to resign as General Superintendent of the Deeper Life Bible Church because of the controversy wey dey trail the wedding of em second son, John. This decision is in spite of the tendered apology and suspension from the Church of the duo of John and Love Kumuyi. The couple, the News yarn say, engaged in acts, wey dey against the church’s tradition during dem wedding for Jamaica on June 15, 2013. 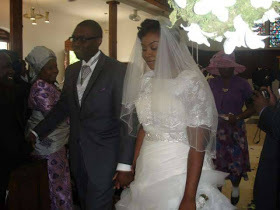 Love, wey be the daughter of the National Overseer of Deeper Life Bible Church, Jamaica, Pastor Augustine Odih, na she dress inside fitted stylish wedding gown wey get transparent short sleeves. She even wear makeup, jewelry and hold flowers for hand. Other items wey dey the wedding na limousine and a huge wedding cake. Tunde Bakare is the one making a mountain out of a mole hill, deeper life has their own standard, if you want to remain a member you should abide by it, otherwise quit. the decision was decisive and laid the record straight. it is good for the posterity and the future of the church. at least those that said masturbation is good will not like this type of decision.